Calling all homeowners! Join us as we walk through our new Deck Guide that will assist District homeowners with their deck building project. 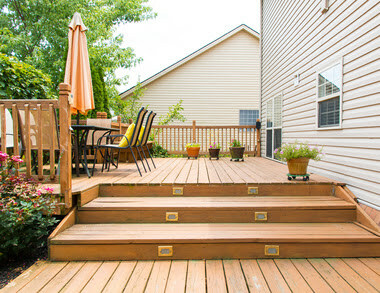 Learn how this tool will guide homeowners through designing a deck, obtaining a building permit and passing inspections. Learn how to use the new DCRA Deck Guide to ease the permitting process when building or altering your existing deck this spring through the convenience of a webinar. The quarterly meeting consists of permitting and plan review updates from DCRA program managers. The open panel discussion is the perfect time for the Permit and Inspections divisions to address any questions or concerns and have a dialogue about how to improve partnership with DCRA. Calling all homeowners! Receive tips on how to select an architect/engineer for your next home renovations project. Join us live as we walk through our Ramp Guide. Learn how to interpret the guide and how to use it to obtain a building permit. Also, ask questions and receive answers from our experts in real-time. If you have any questions regarding these events, please contact Kristen Jones at kristen.jones@dc.gov.